Ryowo MPL series water tanks are made of high quality Fibreglass Reinforced Polyester(FRP).With their tough and durable surfaces and anti corrosion properies, they minimize repair and maintenance cost. Beside, they are by far more hygienic and easier to clean than the conventional steel or concrete tanks. Because they are made up of various sized standard standard panels, the MPL series tanks are more flexible to suit the environment and space available. The standard size panels are 0.5M x 1.0M, 1.0M x 1.0M, 1.5M x 1.0M, 2.0M x 1.0M, 2.5M x 1M. The made up tanks vary from 0.5M3 to 100M3. Various colours are available, thus making the water tank more matching and less obtrusicve to the surrounding building. These tanks are much lighter in weight than the conventional steel or concrete tanks. They greatly reduce the loading on existing buildings and make trasportation much easier. Each standard panel is connected and fixed to the next by bolts and nuts while the joints are reinforced by hot dip galvanized steel angles. thus making the outward look of the tank more neat and tidy. The air vent is located at the highest point of the tank and is equipped with a stainless steel net to keep out all insects. 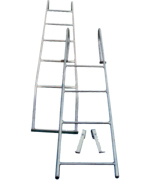 The fittings panel is flat in design and make installation of fittings easier. The special designed convex shape panels are stronger and better in appearance. 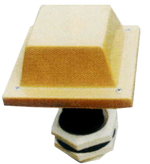 The manhole lid is O 600 for convenient entry for service and float valve adjustment. The stay parts are to secure and fix the panel or the stand posts. Sockets provided are O1/2" to O 4" and are equipped with half thread and full thread for direct connection to water pipe and float valve.Flange connections can be provided on request. The reinforcement angles between joints are hot dip galvanized steel which make the whole tank construction more sturdy. Tanks over 2M high are provided with internal and external ladder assemblies for ease of water tank inspection and service. Bolt & nuts are high quality cadmium plated to minimize corrosion. The PVC stand posts are for the support of the tank top. The tension rods are to reinforce the tension between panels to prevent distortion of the tank.